Admired for their impressive palmate antlers, Fallow Deer bucks offer an impressive mount for any trophy hunter. This small to medium sized deer exhibits a wide variety of colorations and High Adventure Ranch is home to white, chocolate, and spotted species. Fallow Deer hunts offer some interesting challenges as bucks tend to be very wary of humans and extremely agile, if not somewhat stiff-legged in their movement. The young bucks, does, and fawns will typically live and travel in herds, but older bucks are solitary animals. High Adventure Ranch has been producing Fallow bucks for years and currently has many animals including record book deer. 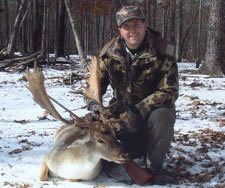 Choose your method of hunting from rifle or hand gun to bow or black powder and from spot & stalk or 4x4. Management Fallow Bucks and Doe hunts available on a first come, first serve basis from September 1st thru December 31st. These hunts make for some of our most challenging hunts while providing excellent table fare at very affordable prices. They make excellent youth hunts as well. Must book now as availabilities are limited for these hunts. Click on these links for more information on our Accommodations, Meat Processing and Taxidermy. For more information on our Fallow Deer Hunting at High Adventure Ranch, please call (314) 209-9800 or fill out our contact form.